Involuntary moans, sometimes hiccups, random sighs, and often a wow! or other unconscious exclamatory remark are all normal side effects when you are taking heavy duty opiates like fentynol, morphine, and dilaudid. (Scott is taking all three.) I can’t help but respond to these distressing sounds and ask him if everything is all right…does he need an ice chip, or, is he in pain? Sometimes he can’t abide me fussing over him. Tonight we were watching a heavy monsoon rain shower with the patio door open. It hasn’t rained so heavy in about two weeks and every downpour could be the last of the monsoon season. From the bed next to my chair I heard Scott say flatly,Oh boy. Thirty seconds later another Oh boy. Before I could say anything he said Oh boy again which was followed quickly with Just let me ‘Oh boy’, okay? 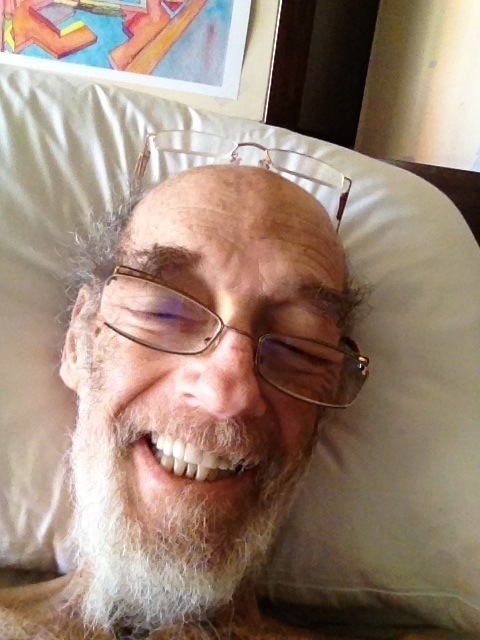 This entry was posted in Uncategorized and tagged finding humor in cancer, Going to Goa Blog, Katy Allgeyer, monsoons, Scott Morgan, side effects of opiates, terminal illness, traveling with cancer. Bookmark the permalink. I hope people realize I am not making fun of Scott. I am finding the humor and letting light in to poke fun at a very heavy situation. Ray Weed wanted me to give Scott his best. He’s thinking good thoughts, sending your way. message and good thoughts received. scott nodded and squeezed my hand. hahaha always smart to have an extra pair of glasses on your head! tell scott he’s still making us laugh! love you katy! Scott is in good mood. Very impressive. Scott ,keep it up.